Data effective 10/16/2018. Offers and availability may vary by location and are subject to change. *For 12 months with a 1-yr agreement & Autopay. Are you better off with Optimum or AT&T U-verse as your TV provider? Choose Optimum for international programming and a contract-free experience. 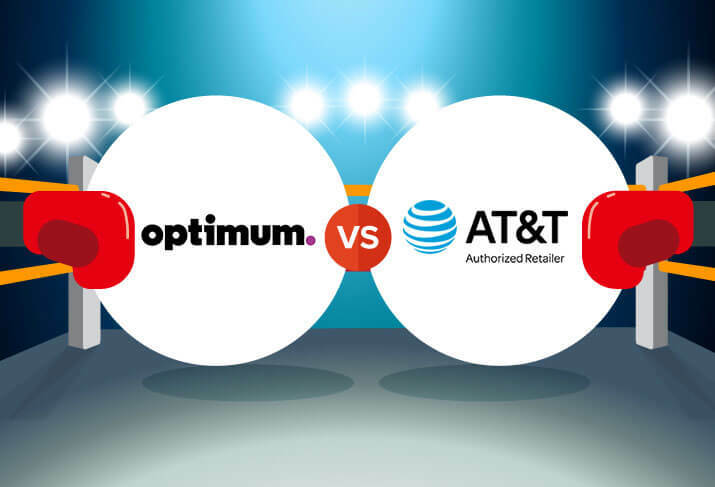 Optimum’s biggest advantage in this matchup is the lack of a contract. That’s huge—it means if you don’t like the service for whatever reason, you’re free to drop it whenever you like, no strings attached. The other big advantage is the available international programming—you won’t find a better selection anywhere else. Unfortunately, the limited availability of Optimum means that unless you live in New York, New Jersey, or Connecticut, it’s not an option for you. Choose AT&T U-verse for reliability and customer service you can count on. AT&T sits in the top five providers in our customer satisfaction survey and enjoys a good reputation for customer service overall. AT&T also brings the reliability and speed of fiber to the table, and the DVR is powerful (if a little light on features). The trade-off is you’ll have to come to terms with the one-year contract and the comparatively high package prices and installation fees. AT&T acquired DIRECTV in 2015, which is why you’ll now see DIRECTV advertised on AT&T sites. DIRECTV is an outstanding TV service and consistently ranks at or near the top in our customer satisfaction surveys. Although it isn’t advertised as heavily these days, AT&T does still offer the U-verse fiber TV service in select markets, and it’s a great TV service. DIRECTV may be the more popular television option available from AT&T, but in this post, we’ll focus primarily on reviewing TV from AT&T U-verse. 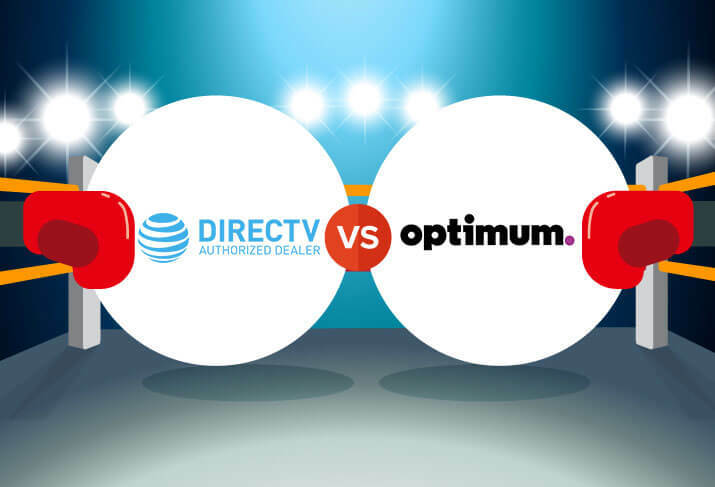 For more info on DIRECTV, check out our DIRECTV vs. Optimum showdown. To see customer satisfaction scores for the major TV providers, check out our 2017 Customer Satisfaction Survey. Optimum installation is pretty standard, with a modest installation fee. You’ll need a cable box for each TV in your home, which does tack on an extra monthly charge of around $11.00 per box. While that’s not necessarily out of the ordinary, it is something to be aware of—especially if you have a lot of TVs in your home. There are no installation fees for U-verse TV, although there may be some for internet packages or bundles. However, the company will attempt to charge you a $35.00 activation fee for the service. You might be able to have this fee waived, though, if you ask. In fact, it’s probably worth asking them to waive any fee you’re uncomfortable with. You never know when you’ll get lucky and catch the rep in a generous mood. Optimum has a great channel selection, bundled in a solid assortment of packages. From the budget-minded Optimum Core package to the top-tier Optimum Premier, everything is laid out in an easy-to-understand format: pay more money, get more channels. The Optimum Select package is probably the best deal of the bunch, with 340+ channels for $74.95 per month. 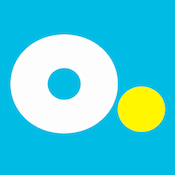 Optimum also offers a ton of international channels, so if you like to watch TV in other languages or just want to catch some overseas programming, Optimum is a great pick. U-verse also offers a big channel selection, coming in at a number that’s a good chunk above Optimum’s. The package choices are straightforward, but the naming is a little odd—each package has a number in the name, and the numbers don’t correspond at all to the actual number of channels in the package. The U200 package, for example, has over 360 channels, while our favorite, U300, offers over 470 for just $60.00 per month. Compared to other providers, Optimum’s overall ranking in this category has improved a good bit since last year’s satisfaction survey, where it came in second to last. The company now sits right around the middle in its ranking. That said, Optimum’s actual rating for reliability has dropped—this probably reflects more on the industry as a whole rather than Optimum specifically, though. AT&T is as middle-of-the-road as it gets when it comes to reliability—the company literally scored dead center in the rankings in our latest satisfaction survey. While that isn’t necessarily a bad thing, U-verse is a fiber service, and fiber is meant to be more reliable than cable and satellite. Seeing it score so much lower than several cable and satellite providers is a bit disheartening. Optimum landed in the bottom three for billing satisfaction in our survey, with a score of just 2.40. Part of the dissatisfaction here probably comes from the numerous small fees that get tacked on to your bill. There are sports surcharges, cable box receiver fees, equipment lease fees, DVR service fees—you get the picture. It’s not hard to rack up $40 per month in additional fees, which suddenly makes the low package prices a little less appealing. 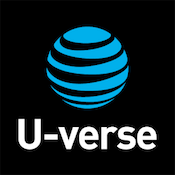 U-verse packages cover a wide range of prices, from a low of just $35.00 per month for the U-family plan to a high of $110.00 per month for the top-tier U450 package. Unlike Optimum, these prices are close to what you’ll actually pay. There are still some additional fees but not nearly as many. In fact, there’s no DVR fee at all, which is nice to see considering how fundamental a DVR is to enjoying TV service these days. 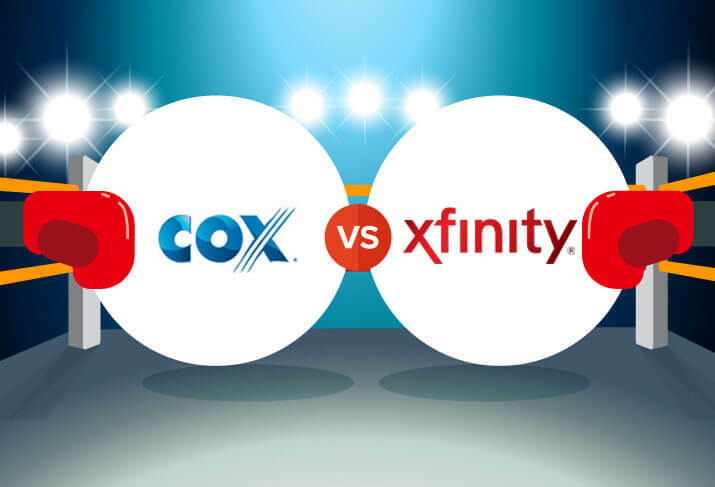 Optimum scores lower than AT&T in this category, but as always, we remind readers that every television provider surveyed comes in with mediocre scores on customer service. Although its score isn’t exceptional, Optimum’s customer service is reasonable, with quick response times and real live human beings manning the chat support. The support site is also solid, with easy navigation and plenty of information available. AT&T offers the standard tech support options—you can call, chat, or visit the customer support site to handle any issues you have yourself. In general, we recommend you try these options in the reverse order. First, check the support site for solutions, then go for the chat option if you can’t find what you need online. Phone calls to cable companies will likely take longer, so use this option as your last resort. 8" x 6.1" x 1.6"
Read our roundup of the best DVRs of 2017. Check out our complete review of the AT&T U-verse Total Home DVR. Check out our full review of on the go TV streaming apps. Optimum’s internet service is available both individually and bundled with TV and phone. There are several speed tiers available, from 200 Mbps up to 400 Mbps. A speed of 200 Mbps is a generous low-end that should be more than enough for single folks or even families, whereas 400 Mbps should be enough for even the most dedicated downloaders. Internet-only plans start at $44.99 per month with Optimum. Our favorite plan is Optimum Internet 200, which offers 200 Mbps for $44.99 per month. AT&T’s internet is actually one of its stronger points. Its fiber plans are fast and benefit from fiber’s equal upload and download speeds (cable internet typically has much slower uploads). This makes it perfect for content creators like YouTubers. Speeds range from 5 Mbps up to 1 Gbps. Available speeds can vary widely depending on where you live, so make sure to check your available plans by entering your zip code below. Internet-only plans from AT&T start at $40.00 per month, and bundles are available with phone and TV service. We like the AT&T Internet 1000 plan, with 1000 Mbps speeds for $90.00 per month. Optimum is a relatively small cable television provider that primarily serves New York, New Jersey, and Connecticut. Optimum is actually the operating name of Altice USA, a subsidiary of Altice NV and a multinational telecommunications company. Optimum will eventually be rebranded as Altice, possibly as soon as next year. AT&T is the largest pay-television provider in the United States and one of the largest companies in the world. 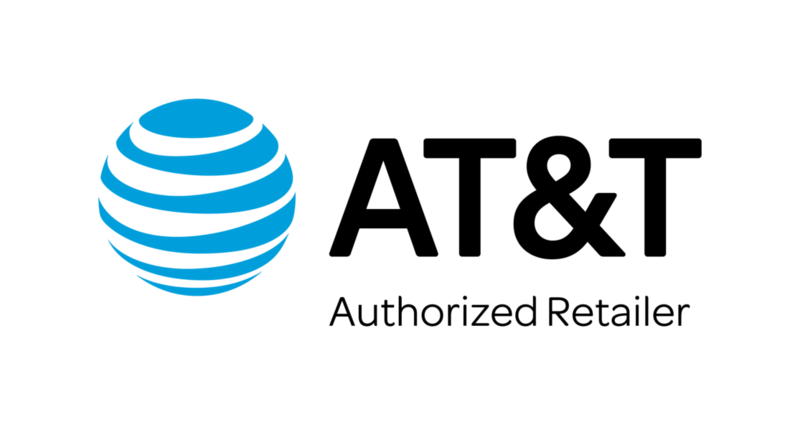 AT&T is available in twenty-one states across the country and services over 46.6 million video connections through DIRECTV, DIRECTV NOW, and U-verse. In addition to TV services, AT&T also provides internet, phone, and cellular services across the United States.